Top 25 Tech Quotes | Cenetric, Inc. These 25 notable quotes in tech history have become legendary sound bites. It’s hard to rank quotes by how notable they are. So I faked it by listing them using an imprecise, unscientific factor I call Googleosity: the number of results Google reports that reference (or riff upon) each quote. (You may quibble with the queries I performed to determine Googleosity, but I tried my best.) Googleosity tends to reward quotes that are not only famous but fun–they’re the ones that people like to allude to, to parody, and to generally weave into blog posts and other onlne conversation. Circumstances of origin: In an “open letter” dated February 3rd, 1976 and published in several computer magazines of the day. Circumstances of origin: During a speech Dell made before thousands of attendees at Gartner’s Symposium and ITexpo97 on October 6th, 1997. Why it’s notable: Apple was in such dire straits in the late 1990s that you can make the case that the mail-order magnate’s recommendation that the company be shuttered was the most rational analysis of the situation. Or at least that it was merely a more extreme expression of the widespread expectation that Apple would be bought out by a mighty tech company such as Sony or Sun. Virtually nobody would have believed you if you’d laid out a scenario in which it would become the most influential company in entertainment distribution, wireless phones, and technology retailing–and achieve a market cap worth six times that of Dell. 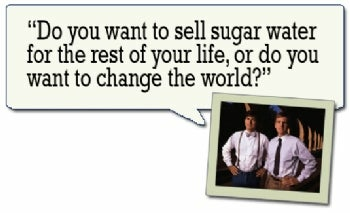 Quote type: Fictional computer message. Circumstances of origin: In Stanley Kubrick and Arthur C. Clarke’s 1968 masterpiece 2001: A Space Odyssey; HAL (voiced by Douglas Rain) is refusing the request by astronaut Dave Bowman (Keir Dullea) to open the pod bay doors. Why it’s notable: HAL’s sentient act of disobedience is one of the most memorable moments in one of the most memorable movies ever. As I’ve written before, it’s also a prescient foreshadowing of the relationship real people would have with real computers starting just a few years after 2001’s release. Life in 2009 is no space odyssey, but every frustrated computer user can identify with Dave–and every PC that refuses to behave has a little bit of HAL in it. Quote type: Inexplicably popular catchphrase. Circumstances of origin: In direct-marketing TV ads for the mail-order PC giant from 2000-2003. Why it’s notable: Did Dell’s “Steven” commercials really air earlier in this decade? The spots, starring actor Ben Curtis as a PC-promoting slacker kid, feel like period pieces from an era when human beings were more easily amused. Yet Steven’s tagline is lodged in the great American consciousness, and it still comes up incessantly, sometimes in the darndest contexts. 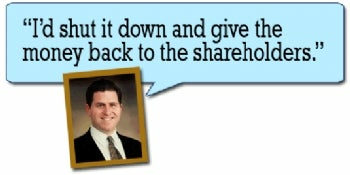 Dell, I suspect, would like to move on–especially given Curtis’s legal woes in 2003. Circumstances of origin: Clippy (more formally known as Clippit) and the other Office Assistants debuted in Office 97. They were eventually deemphasized in Office XP, but only eradicated for good as of Office 2007 for Windows and Office 2008 for the Mac. 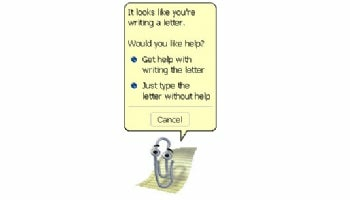 Why it’s notable: Clippy is the most reviled of multiple Microsoft attempts to popularize anthropomorphic helpers, and “It looks like you’re writing a letter. Would you like help?” is his most infamous intrusion. 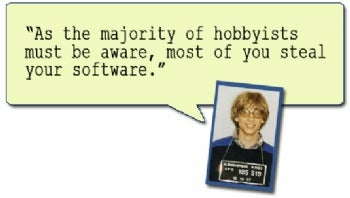 He’s inspired countless parodies (including at least a couple from Microsoft itself and one in software form). Actually, just looking at the little punk makes my blood boil a little. Circumstances of origin: In the 1973 edition of Clarke’s book Profiles of the Future, codified as Clarke’s Third Law. Why it’s notable: Because it gives everybody who creates tech products such a lofty, worthwhile goal to shoot for. 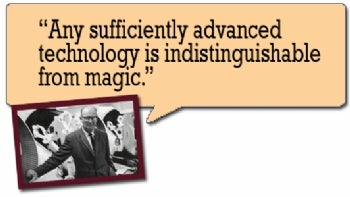 For all the remarkable technologies in our lives, how many of them are truly “sufficiently advanced” by Clarke’s measure? Quote type: Single-minded war chant. Circumstances of origin: Ballmer did his thing at a developers’ conference in 2000, a few days after performing his equally unforgettable Monkey Boy dance at a celebration of Microsoft’s 25th anniversary. Why it’s notable: Well, because it’s so damn strange (and perversely endearing), for one thing. You wanna look away, but you can’t. 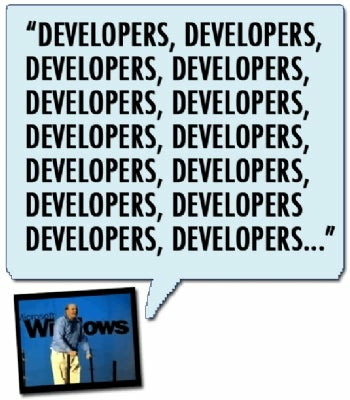 But it also neatly sums up a truth about Microsoft: Say what you will about the company, a meaningful chunk of the company’s success has always stemmed from the skill with which it caters to developers, developers, developers, developers…. Quote type: Apparently apocryphal boneheaded miscalculation. Until someone comes up with evidence—any evidence at all–that Gates said it, I consider him innocent. Although, as this excellent blog post points out, Gates has twice said that he was surprised by how quickly 640K proved to be an inadequate amount 0f memory. Why it’s notable: The quote may be fabricated, but it’s also referenced incessantly–sometimes to make points about tech, and sometimes just to mock Bill Gates. And even if it’s fictitious, it contains a greater truth–the computer industry is constantly misjudging the shelf lives of the technologies it sells us. Quote type: Edgy job interview question. Why it’s notable: Because it’s such a classic Steve Jobsism–brusque, inspiring, ambitious, pushy, and ultimately convincing. Quote type: Kabuki-like catchphrase used by Jobs before final announcement–often a biggie–at Macword Expo keynotes and other product rollouts. Circumstances of origin: I’m not sure when he started using it–I’d like to think that footage will surface of him unveiling, say, the Apple III as “one more thing”–but it was already an in-joke by the time of the 1998 event that introduced the first iMac. Why it’s notable: It’s synonymous with Jobs’ peerless sense of showmanship. If there was ever a time when “One more thing” startled anyone, it ended long ago–the bigger surprise was when he didn’t use it before announcing the first iPhone in 2007. And his most recent use of the phrase at September’s music event prompted a surprisingly blasé response. Circumstances of origin: Very sketchy, but he’s most often said to have said it in 1943. But there’s no real evidence he ever said any such thing: The conventional wisdom is that the “quote” mangles remarks Watson made at IBM’s annual meeting a decade later, when he said that the company expected to sell eight examples of one specific computer on one particular sales trip. Then again, maybe Watson is being blamed for something vaguely similar said by a British mathematician around 1951. 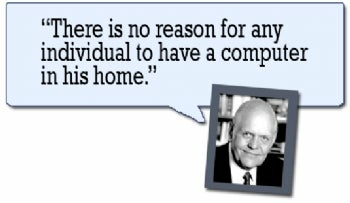 In any event, the data-processing magnate passed away in 1956, after IBM had sold a lot more than five computers but before he could defend himself. Circumstances of origin: During a scientific experiment at his laboratory in Boston on March 10th, 1876. 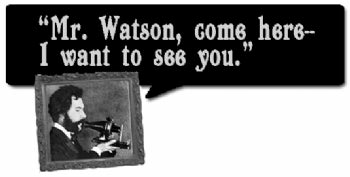 Bell, of course, called out to his assistant Thomas Watson–no relation to the one we just discussed–and thereby discovered that his telephone was working. 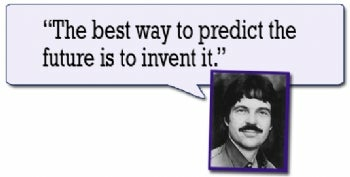 Circumstances of origin: Kay said it at a 1971 meeting at Xerox’s Palo Alto Research Center (PARC), where much of the future of technology was invented in the 1970s–including the graphical interface, Ethernet, and the laser printer. Circumstances of origin: During comments on June 28th, 2006 concerning net neutrality. “Ten movies streaming across that, that Internet, and what happens to your own personal Internet? I just the other day got…an Internet was sent by my staff at 10 o’clock in the morning on Friday. I got it yesterday Tuesday. Why? Because it got tangled up with all these things going on the Internet commercially. Circumstances of origin: During a TV interview with CNBC’s Maria Bartiromo on October 22nd, 2006. Why it’s notable: The leader of the free world was famously tongue-tied–and hey, he told Bartiromo he used “the Google” only “occasionally.” Whether he misspoke or didn’t know what the world’s favorite search engine was called, his fumble has been intentionally repeated countless times by others in the three years since he made it. *This number probably overstates this quote’s Googleosity–sadly, the Google makes it hard to form a query that accurately captures references to Bush’s gaffe. Why it’s notable: Steiner’s cartoon–whose caption is endlessly riffed upon to this day, often by folks who probably can’t identify where it came from–neatly summarizes the democratizing effect of the Internet. In retrospect, it’s amazing that it did it sixteen years ago–before Netscape, before Yahoo, and before many Americans had ever logged onto the Net at all. Quote type: Time-honored WAV file. Why it’s notable: Edwards, a broadcast-industry veteran and husband of an early America Online employee, is the voice behind the three words that have been heard billions of times by millions of people over the past twenty years. (He was also responsible for the less iconic “Welcome,” and “Goodbye,” and “File’s done!”) “You’ve got mail!” is as emblematic of AOL as the surging sea of demo disks it once pelted us with; it was made into a movie and continues to serve as the inspiration for maybe half of all headlines relating to AOL. In short, it’s hard to imagine AOL without it. Circumstances of origin: Uttered by the 43rd president during a presidential debate on October 8th, 2004. 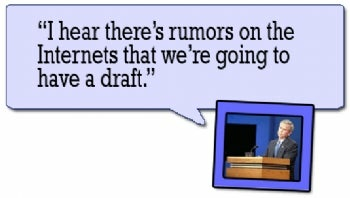 He also referred to “the Internets” during a debate on October 17th, 2000 and in an interview on May 2nd, 2007. Why it’s notable: It may have been a simple slip of the tongue–okay, one made repeatedly over the course of years–but “the Internets” and its variant, “the Interwebs,” have transcended simple memehood. 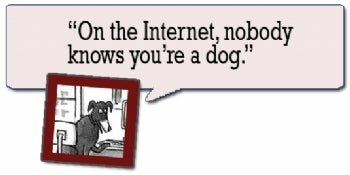 On much of the Internet, the terms are used in discussion of Internet-related matters that isn’t otherwise particularly wacky. I wonder if the former president knows he gave the Net this little gift, and if so, what he makes of it? Circumstances of origin: During an interview on CNN’s Late Edition with Wolf Blitzer, March 9th, 1999. Why it’s notable: Want to take a convenient cheap shot at the 45th vice president of the United States ? Join the untold legions who have accused him of having claimed to be the inventor of the Internet. Hoax-debunking site Snopes.com says that Gore “did not claim he ‘invented’ the Internet, nor did he say anything that could reasonably be interpreted that way.” Well, maybe–taken literally, Gore’s words do seem to say that he was a co-creator of the Internet, at least. 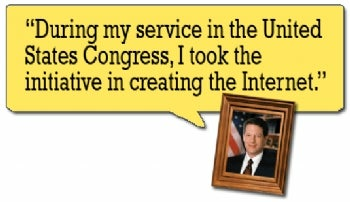 (Originally known as ARPANET, the Internet went online in October 1969, when Gore was a recent college graduate.) 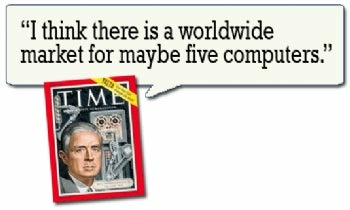 As a Congressman and Senator, the famously tech-savvy Gore did play a major role in communications policy; if he had said he’d been instrumental in “developing” or “expanding” the Net rather than “creating” it, his statement would have unassailable–and it wouldn’t be in this article. Why it’s notable: Beginning in early 2001, it became the most pervasive Internet meme this side of Rickrolling. It continues to flourish, spawning thousands of variants in discussions of everything from politics to public utilities to sports. Most of the people who riff on it can presumably tell you it originated in a game. But the percentage who can tell you which game–let alone who have actually seen it–is probably minuscule. Any nominations of notable quotes I failed to include here–including ones that deserve to be better known than they are? This entry was posted in Fun Posts and tagged Fun Posts on May 26, 2010 by cenetric.